Chateau Fuente is a terrific stick! Super stick for the price. Great size for a quick indulgence. 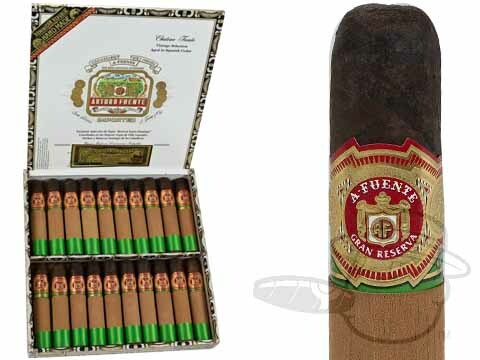 Fuente consistently delivers premium products and the chateau maduro robust is no exception. Mouth full of smoke with complex flavors. The Chateau is my fav. Excellent roll with an ash that'll hang til the end. Nice draw and slightly spiced mocha flavor. Can stretch this stick to nearly an hour but 35-40 minutes is average. For under $5 per, this is an excellent maduro. Nice flavor! Satisfying...with just a little! This cigar has always been one of my favorites. It is satisfying with just a few puffs. Fuentes are my everyday smoke. I love this product for times when I just do not have time for a full size cigar. The maduros are my favorite wrapper. Excellent in presentation, construction, draw, evenness, and body. I rank this slightly better than RP Vintage 1990 or Padron 2000 which are more expensive and higher ranked. Arturo Fuente Chateau Maduro is rated 4.7 out of 5 based on 16 customer ratings.